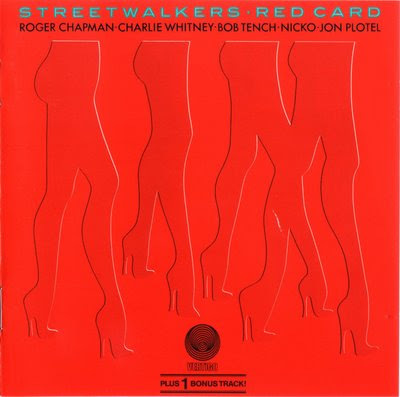 Chapman and Whitney recorded the first Streetwalkers album after Family's farewell tour in 1973 with help from ex-Jeff Beck Group guitarist Bob Tench, members of King Crimson, Linda Lewis and another former Family member John Wetton. At this stage Streetwalkers were a loose knit collection of individuals not a group in the real sense at all. After Chapman's work with Family the album was a real anti-climax. For the Downtown Flyers album Chapman and Whitney assembled a more stable line-up (B). John Plotel was previously with Casablanca. The album veered towards R&B and soul and Chapman's vocal style was much more mainstream than what he'd been doing with Family. Their most successful album commercially, though, was Red Card, which got to No 16 in the UK Album Charts. The group were popular on the Continent too, particularly in Germany. Their final 45 'A' side, Daddy Rolling Stone was a Derek Martin R&B track. Internal friction ripped line-up (B) apart and line-up (C) recorded their remaining two albums to increasing public indifference. Inevitably, though Roger Chapman, a man of considerable talent, went on to make solo albums and he appeared in TV commercials. McBrain later worked for Pat Travers and was then in Iron Maiden. Tench and Feat worked for Van Morrison and Johnson and Dowle were in David Coverdale's Whitesnake. This near-classic outing from the underground R&B/rock supergroup that was propelled Roger Chapman and Charlie Whitney from Family, and future Iron Maiden drummer NIcko McBain features 9 cuts including the rare bonus track, "Hole In Your Pocket." Any Chance of it in lossless? flac is best.